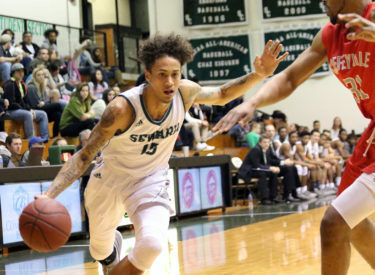 LIBERAL, Kan. – It was another heartbreaker in the Greenhouse on Wednesday, as the Seward County men’s basketball team took the No. 17 Coffeyville Red Ravens down to the final seconds, but ultimately losing 67-64. It marks back-to-back one possession home game loses to a ranked opponent, as the Saints fell to 13-11 overall and 9-11 in the Jayhawk conference. It was a rough going for both teams in the opening minutes of the game, as the two squads combined for seven turnovers in the first three minutes of the game. The Red Ravens took the lead with a three-pointer at the three-minute mark and held on until Ke’Sean Davis connected on a triple from the wing to give the Saints a 12-11 lead with 12:22 left in the half. The next nine points all came from deep, as Terrell Alfred and Hegel Augustin both connected on their own threes. Though Coffeyville tried to make runs, the Saints always had an answer to prevent them from retaking the lead. The Red Ravens came within one-point or tied the game, six times over the final five minutes of the quarter. They final retook the lead with a three-pointer with 24 seconds left, but Jamel Horton answered with a jump shot on the other end just before the half ended. However, the Saints left too much time on the clock, as Coffeyville connected on a half-court buzzer beater to take a 34-32 lead into the break. Seward shot 41.4 percent (12 of 29) from the floor and 28.6 percent (4 of 14) from behind the arc. The Red Ravens finished the half shooting 42.3 percent (11 of 26) from the field and 41.7 percent (5 of 12) from deep. The two teams combined for 20 turnovers in the first half, with Coffeyville turning the ball over 12 times. Coffeyville quickly widened their lead, pushing it to nine points in the first three minutes of play with an 8-2 run. That gap forced the Saints to play catch up for the remainder of the game. Isiah Small cut the deficit to three points with 14:04 to play, but the Red Ravens went on a 7-0 run to push the lead to a game-high, 10 points. The Saints did all they could to fight back into the game against the No. 17 team in the nation, but every time Seward would get close, the Red Ravens would have an answer to pull away. With 6:39 to play, Isiah Small cut the lead to three-points again, by a score of 56-53, but another 7-0 run prevented the Saints from getting any closer. With 31 seconds left, Hegel Augustin connected on a three to bring the game to 66-64. The Saints fouled with 19 seconds to play. A missed free-throw allowed the Saints the chance to tie or go for the win, and the Saints decided to go with the latter. Unfortunately, Coffeyville blocked the three. Another foul attempt put the Red Ravens at the line, where they went one-for-two. A last second half court heave by Augustin bounced off the backboard, ending the game 67-64, with Coffeyville winning. Seward shot 43.4 percent (23 of 53) on the day, and made 9-of-29 (31%) from behind the arc. However, the Red Ravens had their way with the top-ranked Saints defense, shooting 41.4 percent (24 of 58) from the floor and 47.6 percent (10 of 21) from deep. Three Saints scored in double-figures, with Augustin leading all scorers with 19 points. Small (16 pts) and Davis (12 pts) each reached double-digits as well. The Saints will head to Allen at 2:00 p.m. on Saturday (Feb. 10) to take on the Red Devils. Allen will live-stream the game and it can be heard on 107.5 KSCB with Brock Kappelmann (pxp) on the call.